These Sheet Pan Ultimate Nachos with Slow Cooker Salsa Verde Ranch Chicken are the perfect Game Day food! Get everything you need at Walmart and serve them with not one, but TWO easy sauce options for dipping the cheesy, loaded nachos in before devouring! Combine the chicken, Pace® Salsa Verde, packet of Ranch seasoning, and cumin in a slow cooker. Cook for 3-4 hours on high heat or 5-6 hours on low heat. If using frozen chicken, add an extra hour to the cooking time. When chicken is done, shred with two forks. Heat oven to 400 degrees. Line 2 large baking sheets with foil. Arrange tortilla chips in a single layer on each pan. Drop small dollops of refried beans over the chips, then top with the shredded chicken and black beans, dividing evenly between each pan. 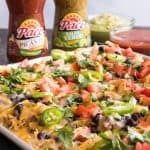 Sprinkle 3 cups of the shredded cheese over each sheet pan of nachos, then bake in the oven until the cheese is melted and bubbling, about 8 to 10 minutes. You may have to do this in batches if your oven can’t hold both sheet pans at once. Remove nachos from the oven and top with the green onions, tomatoes, jalapenos, and cilantro, sprinkling them evenly over top of each pan of nachos. Serve immediately with Pace® Picante sauce and Creamy Avocado Salsa Verde. To make the Creamy Avocado Salsa Verde, simply combine 1 cup of Pace® Salsa Verde in a food processor or blender with 1 large or 2 small ripe avocados and blend until smooth. This makes a LOT of nachos which is great for a crowd. But if you are having a smaller gathering, just divide the recipe in half. Although I would still make a full-size batch of the Salsa Verde Ranch Chicken and just save the leftovers for tacos or enchiladas or quesadillas later in the week.